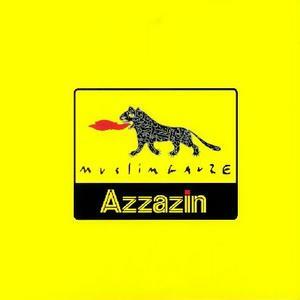 Azzazin’ is a double standout Muslimgauze album, first LP originally issued in 1996, as a CD and the second LP as a 10″ Tightly focused on a singular palette of monotone drones and swarming electronic buzzes, which arguably sound like a parallel to early Editions Mego. They’re probably the most minimalist Muslimgauze tracks you’ve heard, and even still he manages to express a fine range of abstracted emotions, from aggressive buzz to tender ambient pieces and spectral concrete prisms. Starting with an extremely minimal opening number – it’s no surprise Finnish experimental duo Pan Sonic are Muslimgauze fans, based on this track – Azzazzin has a much more electronic feeling than most of Bryn Jones’ other albums, eschewing the traditional elements used elsewhere for a rough, quietly aggressive and disturbing feel. The fourth track, with its unpredictable keyboard snarls over a low, quiet pulse, and the sixth and seventh songs, with distorted, high-pitched noise tones mixed with a soft series of bass notes and a slight spoken-word interjection from time to time, are some of the strong points from this intriguing release.